Located in a historic part of South Haven, this turn of the century home will accommodate 10 guests in 6 bedrooms with 2 baths. 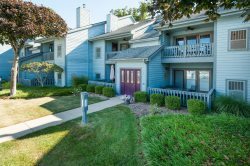 Listen to the waves of Lake Michigan from the screened in porch, enjoy watching the kids play in the large yard, or take a short walk up the riverfront to the marina to watch the boats on the Black River or to town for some Sherman's Ice Cream. Just 1 block to South Beach. Working with your team was easy and efficient. Wonderful time spending time with family. Your team has been awesome! I think it is clear we were very disappointed, I don't believe we will return as a family. I do think this property needs updated, some soap on the side of those old dresser might help. Stating in the description that the house is more of a bed and breakfast feel. I understand that this is someone vacation home, I mean no disrespect, we spent so much money and we felt the accommodation should have been better. I called to ask if there was a high chair on the property. I received a call back with confirmation that there was not one. But it was really nice to get that confirmation. Your team was fantastic. I had to call a couple of times for minor issues, and all were handled efficiently, with very friendly and helpful team members! We had a fantastic week at Driftwood Manor. It was a week of family fun...cooking out, playing yard games, doing puzzles and enjoying all that South Haven has to offer. We really loved our time there! the vacation property was everything we envisioned and more. Great location to the beach, marina and shopping district. We were able to walk to all locations. Everyone had a great time. I made two calls, and both concerns were immediately resolved. Great service! The location of the house, for ease at getting to the beach and downtown, cannot be beat! The process of selecting a house and booking the dates for stay was very simple. Shores vacation rentals was very prompt in sending notifications and instructions for our upcoming rental. Peace and joy on Lake Michigan.